After reading that this movie was over 2:30 minutes long I knew a quick shot of espresso was in order. A cup of coffee may have been too much liquid to consume before such a long movie. So, how was the movie you ask. Well, it was a really good sci-fi movie in that it had a believable plot. Escaping one dying planet to repopulate on another was exciting to see. We won’t give away the whole story, but there were a lot of planet scenes. This was seen in IMAX, but not IMAX 3D. Interstellar may not have been made in 3-D. 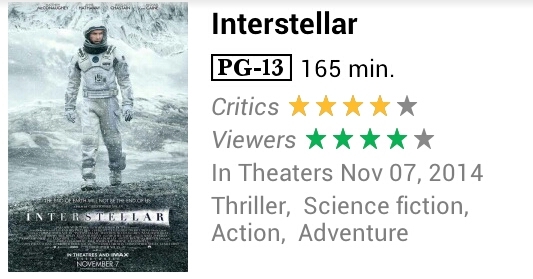 I recommend this movie if you like sci-fi. This was way more fun to watch vs the Gravity movie. If you can see it in 3-D, then I VERY recommend. Be sure to view this at an early showing since the movie takes nearly THREE hours to see – that is counting the movie previews, pre movie popcorn purchases, etc.